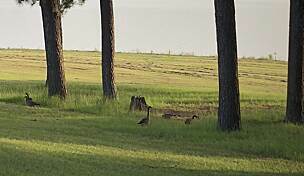 Stretching over 42 miles northwest from near the University of Southern Mississippi in Hattiesburg to small-town Prentiss, Longleaf Trace traverses landscapes that range from the bustling heart of Mississippi's third largest city to the rural farmland that predominates in this area. 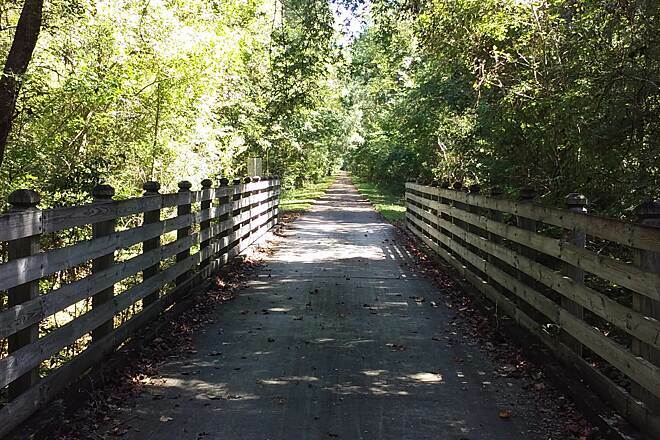 A designated National Recreation Trail, it runs atop a stretch of Mississippi Central Railroad line that saw much activity as the region's timber industry flourished between the late 1800s and 1920s. As the industry began to fade, so too did the need for the rail service, and although the railroad struggled into the 1970s, it eventually ceased to be economically viable. 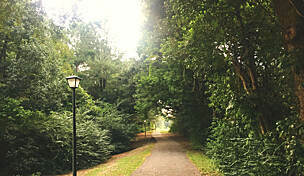 Fortunately, a concerted effort by local groups and individuals preserved the corridor, and in 2000 it opened as a trail. 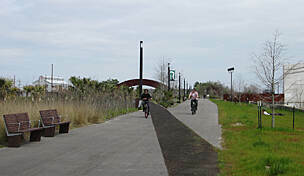 Today, the route is again active, as cyclists, inline skaters and pedestrians ply the trail's smooth, well-maintained surface. Eight small covered rest areas along the route provide travelers with shade, restrooms and vending machines, while three small shelters offer places to wait out brief summer rain showers. Over the first few miles, the trail negotiates several tunnels and bridges. 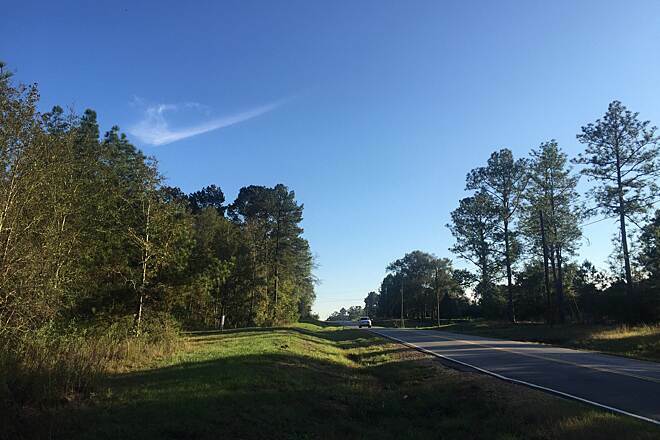 Leaving Hattiesburg behind, you'll progress through a range of quintessentially Southern landscapes, from piney woods and wetlands to small lakes and charming towns. In Epley, 15 miles northwest, the trail meets a dirt equestrian path that zigzags across the Trace some 25 miles to Carson. Thirty-three miles out, just past Bassfield, is a stable, while 2 miles farther is a primitive camping site. The rolling hills that define this section may pose a challenge to less experienced cyclists. While the grades aren't particularly steep, factor them in if you're on a day trip or traveling with small children. 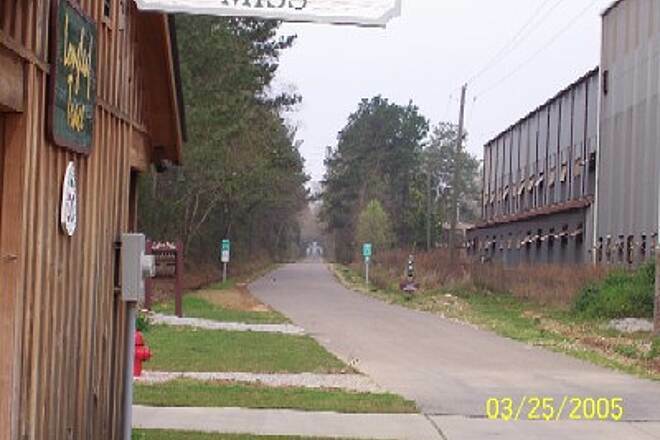 At trail's end in downtown Prentiss, an attractive trailhead provides restrooms, parking and vending machines. If you've chosen to end your trip in Hattiesburg instead, consider renting a canoe and plunging into Black Creek, a National Scenic River about 10 miles south of the Southern Miss gateway. Like the Trace itself, the creek will take you for a gentle, slow-moving ramble through central Mississippi's piney woods. 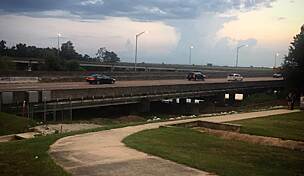 To reach the Hattiesburg gateway: Take I-59 to Exit 65/Hardy Street and head east. Following the brown trail signs, turn left on 38th Avenue then right at the next light on Fourth Street. Just past the Southern Miss football stadium, turn left into the trailhead parking lot. To reach the Prentiss trailhead: From Hattiesburg, take US 49 about 27 miles northwest to Collins and turn west on US 84. 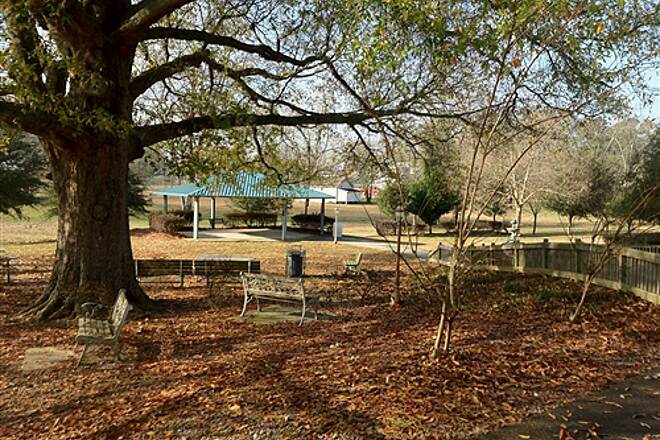 Nearly 20 miles west in Prentiss, the Trace crosses the highway near its trailhead in a park. Just shy of this crossing, turn right on Front Street to access the trailhead. A nice day for a nice ride! Rode the trail from the Hattiesburg trailhead at USM to Prentiss and back on September 29, 2016. The weather was great! First cold front of the fall and the temps were in the low 70's to low 80's. I agree with pretty much everything that has been said. This is an excellent trail and nicely maintained! There are restrooms and water stops with soft drink machines all along the way. There is also a Ward's Hamburgers right off the trail near Bassfield if you need some lunch. Since it was a Thursday, there weren't a lot of people out using the trail, and from Sumrall to the end at Prentiss, I think I saw perhaps 4 or 5 people. There are long stretches of straight runs, but very subtle changes in elevation. Between Bassfield and Prentiss, the trail showed signs of little use with leaves and limbs on the asphalt, but nothing that would hinder you at all. I did see six deer at different spots around Carson. One person spoke of being harassed by dogs, but I never had any problems. There are several bridges between Carson and Prentiss which help break up the monotony at times. The asphalt between Hattiesburg and Sumrall is showing signs of wear and patches are visible in areas. Overall, an outstanding trail! It is a tough ride to do all 82 miles round trip, but as long as you stay hydrated, carry snacks and pick a nice day, it can make for a nice day out. Just know your limits and know when to turn around if you need to. Lots of places to stop and use the restroom as well as fill up your water bottle. There are also vending machines and a lot of shaded spots to sit and rest. Great job with the trail. Nice to grind out some miles without the sun baking you. I started my ride at the northern terminus, Prentiss, where there is a very nice shaded trailhead/mini-park with restrooms (opened at 8:30 a.m. on Saturday). After a couple of miles under a nice overcast sky, I took the 1 ½ mile paved spur (grades up to 15%) that led to Jeff Davis Lake. This would be a great place to bikepack camp and fish or just to break. Upon returning to the Longleaf, I found the mostly shaded trail winding itself above the creeks, around horse trails, through small towns and among the sunken rail beds of southern MS. I took a break at the Sumrall station where there is a large covered pavilion and vending, typical at most town stations, so bring dollar bills. I continued (40 miles) until I met my wife parked at the Jackson Road Station & Dog Park (1 of 3 parking areas at Jackson Rd.) which was nice but not suitable for picnicking due to dog smells. We began the last 5 miles of the trail to the SMU Gateway by yo-yo’ing 10 miles. 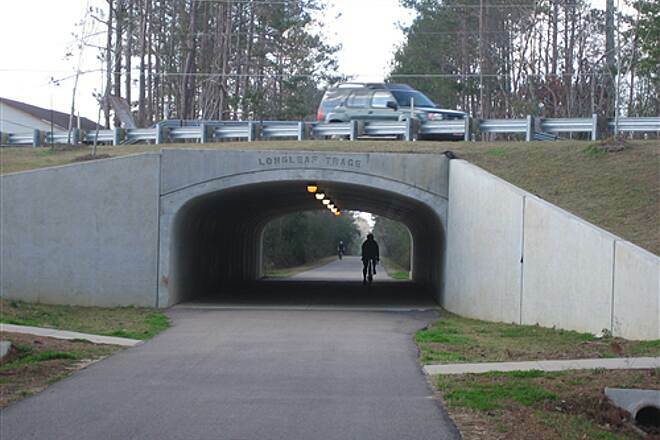 This section of the Longleaf became more populated and urban with a trail bridge over I-59 and two picturesque RR tunnels. Near the south trailhead, there is a snow cone stand up the large wooded stairs. Great treat on a hot day, but you will have to bring your own “sweetener”. We rode our last 5 miles in a roaring thunderstorm that made the trek more memorable, lonelier and wetter. I thought the trail was slightly shy of scenic overlooks, unique local spots and creek crossings but always felt safe while riding and only encountered two small snakes. I love, love and love the “Grand Lady of the South” and MS cyclists! Over this weekend, we stayed in Hattiesburg at the Meador Homestead B&B (bike accessible, ~ 1 ½ miles, from the trail) with Mother Dean for an unbelievable, southern rustic experience. Spent six days in this area. Had the privilege of pedaling this trail from the university. It is fantastic, well marked, and lots of bathrooms and break areas. There was even a multi-level deck overlooking a swampy area loaded with turtles. The locals have really invested big bucks making this one of the best "Hall of Famer" we ever pedaled. You can be very proud of it! I especially like the no littering sign. "If you see litter - pick it up"
I have ridden this trail several times. Rode the whole thing back in December. On Jan.16 Me and a buddy rode from Sumrall to Bassfield. Great ride, nice hills. The trail is kept very clean and smooth. Will be back with my road bike soon. Rode on a 65degree cloudy day, the ride was great! A little bumpy in some spots but relatively flat w/moderate incline, decline. Very scenic w/mile markers and plenty of rest areas. 4.5 star experience for inline skating (my favorite is Courtney Campbell in Clearwater so can't give 5). This trail pretty smooth, beautiful, well maintained, and long. The first mile eve seems like it is lit. 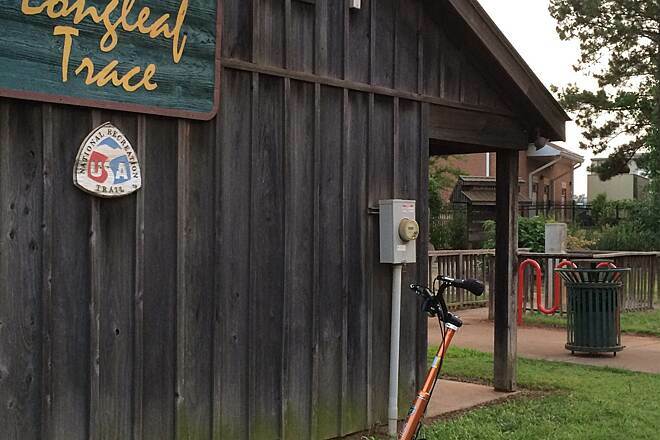 I rode the Tanglefoot Trail recently and thought it was great. I still like the LLT better than any place I've ever ridden. My only ride on the Tanglefoot was with my BIL who rides it several times a month. I invited him to do our century ride on the LLT on November 8,2015 as his intro to LLT cycling. We completed the ride with several hours of light rain and leaves and twigs strewn everywhere due to the previous days' storms. In spite of the adverse conditions, we loved it. On September 16, my wife and I rode the trial out from Hattiesburg for about 16 miles and then rode back. Back in 2005 we rode the entire trail and have always wanted to return and ride again. This trail is one of the top trails in the country. It is clean, wide and scenic without a great danger from road traffic. Our ride began about 9:00AM and was picture perfect. 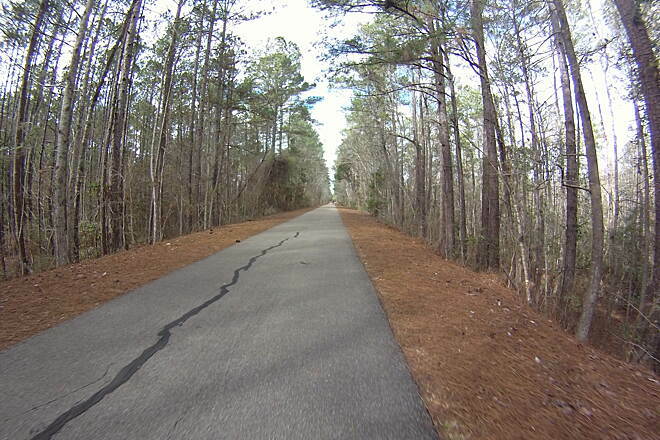 The Tanglefoot trail in MS is also a good trail but the Longleaf Trace is much better. On Thursday, September 10, 2015, a friend and I met in Prentiss and rode the Trace to Hattiesburg and back to Prentiss. What a wonderful place to ride. Overall the condition of the Trace wasn't perfect due to the time of year and weather (lots of wind and a little rain)- lots of twigs, leaves, and pine cones littered the surface. This was a minor price to pay for the canopy provided by the trees. We picked our way through the debris easily without incident. The rest stations and the scenic overlooks made for an enjoyable ride. One complaint is that the three vending machines we tried either were empty, not working, or would only except exact change, but the water fountains we tried all worked. 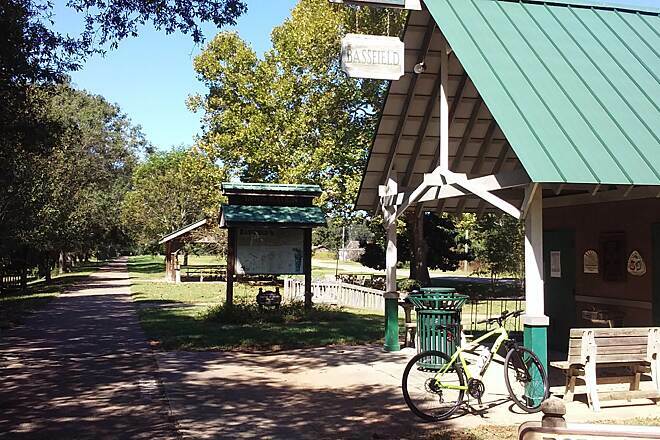 I have enjoyed riding shorter rides on the Trace from Hattiesburg when I visit my daughter there and am thrilled that we have a such a great place to bike in Mississippi. One thing to look out for is pedestrian traffic between Jackson Station and USM. It can be a moving obstacle course. 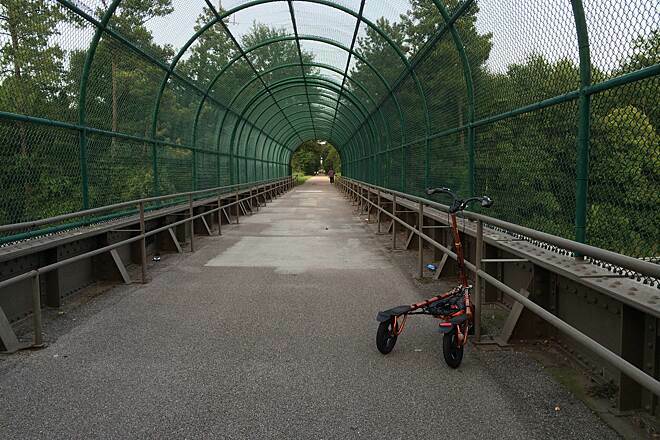 The bikers seem to know trail etiquette, but walkers are unpredictable. You should slow and be prepared to stop any time you see more than two walkers in a group. I look forward to returning to the best place to ride in Mississippi. 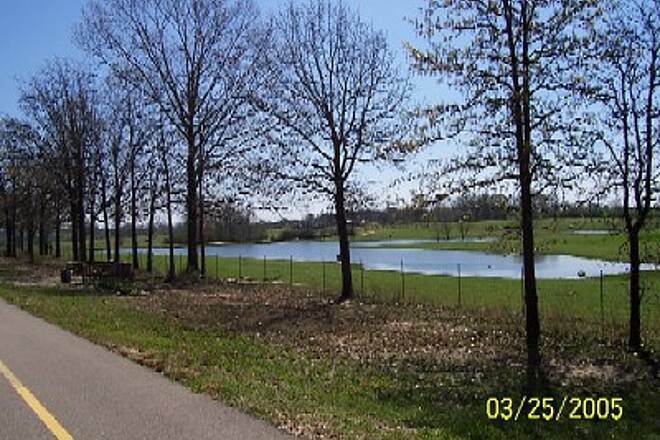 I plan to try the Tanglefoot Trail in the next few weeks - hope it is just as awesome. Rode from Prentiss to Bassfield and back, nice trip! everything worked, couldn't ask for more. We drove over 500 miles from central FL, in early April, just to ride this trail and it was well worth it. The trail is well-maintained, mostly shady (in the morning), flat, tranquil, rural. We rode from University of Southern MS north to Prentiss. The farther north you go, the more rural it gets. The scenery is beautiful and there was not much traffic on the trail during the week. The trail is well-marked and there were a few towns along the way where you could get food and drink. It's one of the most beautiful trails I have ridden. We started at the trail head in Hattiesburg rode out to mile marker 15 and back. Nice ride. 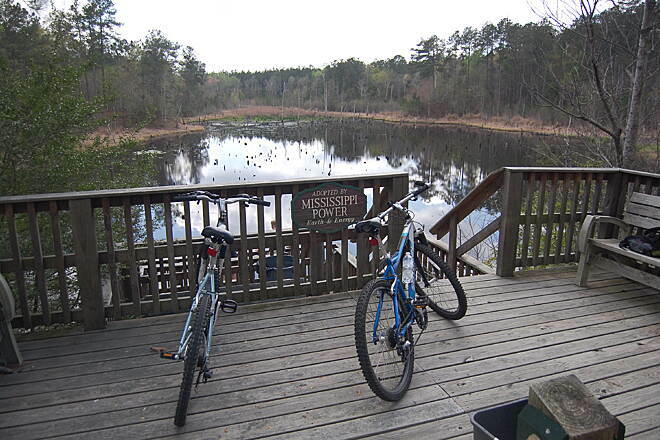 Very nice, we bike about 24 miles near Hattiesburg. I can see why it's in the Hall of Fame. I can think of nothing bad to say about it. Rode the entire trail out and back and had two great days. As mentioned below by rjf39, there are large aggressive stray dogs along the trail in Bassfield. I was chased for over 100 yards by two mixed breed dogs, part pit bull, while bicycling in Bassfield Nov 13, 2014. I contacted Mayor Pat Courtney of Bassfield (601)943-5424, Longleaf Trace Board of Directors member Johnny Kerley (601)943-5003, Trail Manager Herlon Pierce (601)450-5247 and Sheriff Ron Strickland (601)792-5169 of Jefferson Davis County. Each of these people has a reason why the problem cannot be solved. Mayor Courtney told me the dogs have chased her while she was patrolling the trail in her golf cart. She uses hornet spray to keep them at bay. Come on people... get together and get rid of dangerous dogs on the trail. And a hall of fame trail, too. This is a beautiful ride. Very well kept, with lots of rest areas along the way. I went to the birthday ride that was held at Prentiss. My wife and I did 36 miles, and had a great time. The weather couldn't have been more pleasant. The trail is wonderfully maintained with rest stops built all along the ride. Will be frequenting this very often. I rode my road bike here on a 2 week travel around the south. This trail was beautiful and had plenty of stops to refill my bottle or take a bio break. Started in Hattiesburg, MS and once i left the college area there were few people. Of course it was also in the middle of the week so... I like having the long straights to myself and this was the perfect place for it. I will be back. Last year we rode from Hattiesburg to Sumrall and back and loved it. Came back this year and rode from Sumrall to Prentiss. Great trail with very few riders. Not sure why. Food is limited but a beautiful trail. We are winter visitors from Wisconsin. We were here for extended visits in March 2014, March 2012 and January 2011. 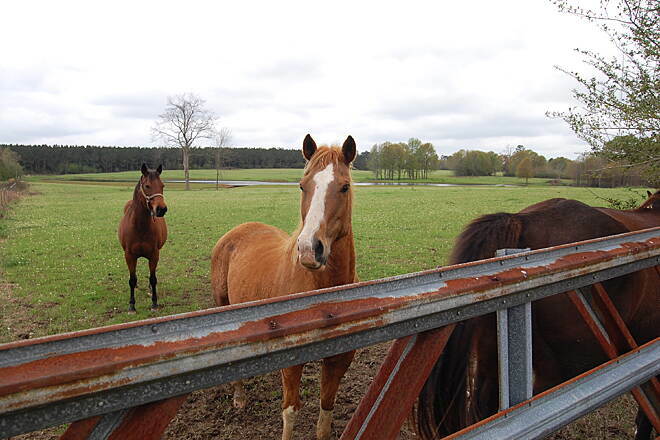 We park our RV at the 4-K Stables in Bassfield. There is just so much good to say about this trail. I've spent a lot of time and ridden lots of miles on the trail. The only negative is that there are dogs that sometimes will chase you. It was better this year. I sent a document to the Wisconsin Bike Fed titled "Maybe Be Like Mississippi," which listed all the good things about this trail that are lacking on trails in Wisconsin. Rode the trail yesterday, started in Prentiss. Rode a few miles and returned to Prentiss. Saw two deer and a few squirrels. Loved it, should have considered the 95 degree heat though. Lots of water breaks. This trail goes for miles and miles through beautiful farmland and countryside. There is a lot of wildlife and domestic animals. Every time I go down the trail I see some critters: white tail deer, alpacas, horses, snakes, birds, and alligators just to name a few. There are a lot of bugs also, so learn to ride with your mouth closed or you'll get an unexpected snack. 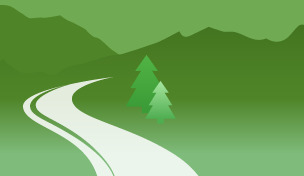 The trail is fairly well maintained and has only slight grades. The road crossings are few and, with only a couple of exceptions, are extremely safe to cross. The only downside to the trail is that not everyone follows the rules and the trail is busy enough for that to have an affect. People will take up the trail like it was built just for them and not yield. Others won't keep right and others won't announce when passing. However, it is an extremely pleasant trail to ride on, especially if you like the critters. 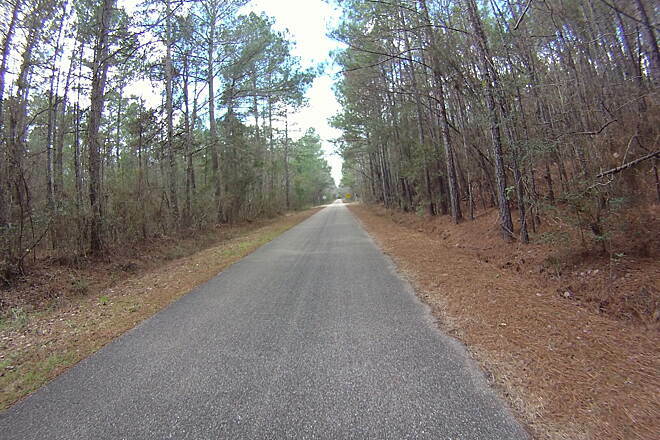 We rode the Longleaf Trace April 26, 2012 on a beautiful, albeit humid and unusually warm, day. Parked our Roadtrek at Sumrall trail head based on an entry for this trail by another RoadTrek owner. Plenty of parking for the 20 foot motorhome. First we rode south to Epley Station. Then we rode back to Sumrall and continued north to Lott Circle. Just after we turned around to head back south this huge eagle flew out of the trees high above us and majestically flew high above the path for a brief moment before taking off again into the trees. I read that eagles can be wintering over in the Mississippi Delta area. Nice trail and in good shape. 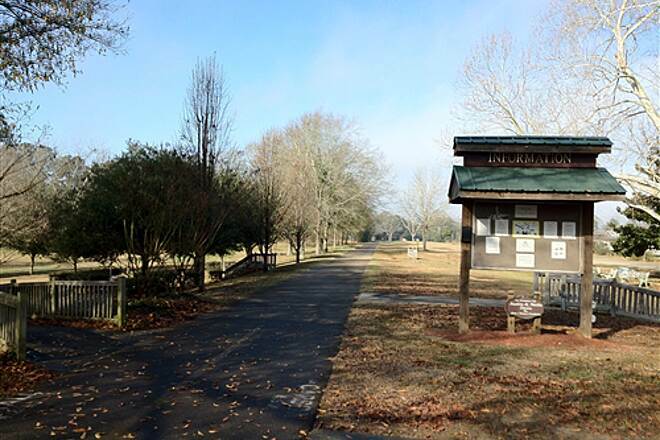 Sumrall trailhead has bathrooms, water fountain, picnic bench, safe parking, and hopefully someday might have a bike shop right across the parking lot. It looked like something was in the making over there. Just finish riding the trail this morning (Feb 28). I rode from Prentiss to Sumrall yesterday and finished in Hattiesburg before lunch today. The trail is well maintained and is enjoyable to ride because of its rural atmosphere and the slight ups and downs. It would be good if they would label the road crossings as most trails are. I'm trying to ride all the Hall of Fame trails and hope to finish the 8 remaining this year. 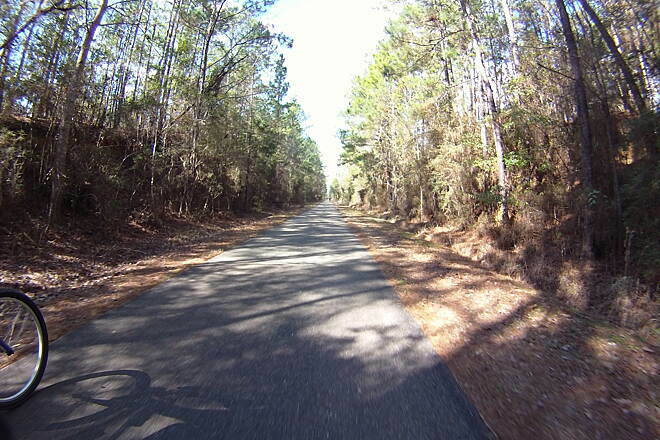 Rode the Longleaf Trace 12-14 of February and was delighted in the condition of the trail. What an asset to the area. Only criticism was at the Prentiss, MS trailhead the restrooms were locked. Thankfully at the Sumrall trailhead the restroom was available and well maintained. Began the trail at USM where parking was ample and protected. The best part of the USM trailhead was meeting Tony who was managing the bike/gift shop. What a delight. Too bad there was no guest book to sign to provide information to the trail managers the number of folks who are riding the trail and where they are traveling from to ride this trail. This type of trail provides an example to other southern states, like my home state of TN, to get in gear and build trails like the Longleaf Trace. Hope to pedal the Trace again before year's end. The day before, we drove part of the route to check out trail heads and parking. We travel in a Class B Roadtrek RV and wanted to be certain of space and safety. 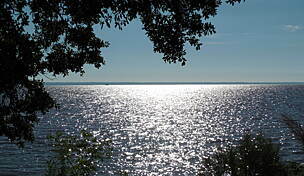 The parking at the Gateway at Southern Miss was great, we felt like Jackson Road Station was a bit too remote and finally settled on Sumrall since we were staying at Okatoma Resort RV Park near-by. We rode from Sumrall to Lott Circle and back (14 miles) and then Sumrall to Epley Station and back (8 miles). We chose to do "uphill" sections on the way out and hoped for a coast on the return. The trail is pretty flat, but we did experience what another review called "long inclines". We are in our late 60s/early 70s and don't get to ride very often but we handled the trip well and loved the well tended and accurate signage along the way. The February day was wet and cloudy but even that didn't dampen our ride on this terrific trail. 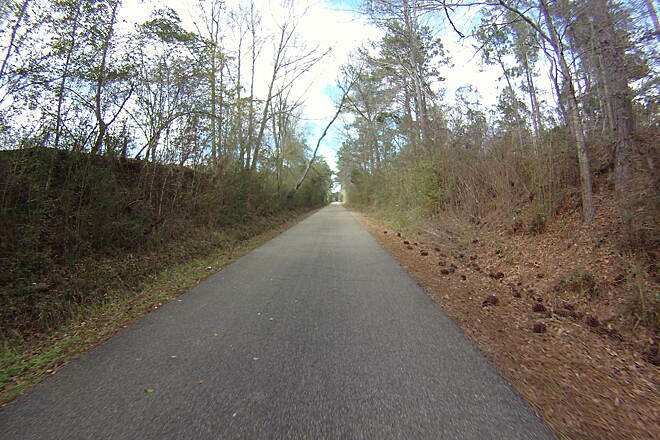 Biked 22 miles of this trail from the Jackson Road Depot to Sumrall and back. The day was one of those gorgeous mid-January spring Saturdays you can only find in the South. Quite a few runners out and very few cyclists. The pathway is very smooth with few cross streets to cause you to stop. Had a good number of rest stops (every 4 - 5 miles) with water/facilities and even an occasional rain shelter. The outbound trip north was very scenic and relaxing. Even better, on the way back you can really hammer it since it is 80% ever so slightly downhill. You can flat out fly. I'm 52 and could pretend my had my 30-something legs were back. I have been on the Silver Comet / Chief Ladiga and other trails and this one compares very nicely with them. Can't wait to try the rest of it. I am a student at the University of Southern Mississippi, I love riding the trace any chance I get. I am originally from Hattiesburg and I actually have about 3 or 4 family members whos property lies directly next to the trace. We all love to hunt so its no surprise that there are a few good ole boys walkin around wielding rifles. 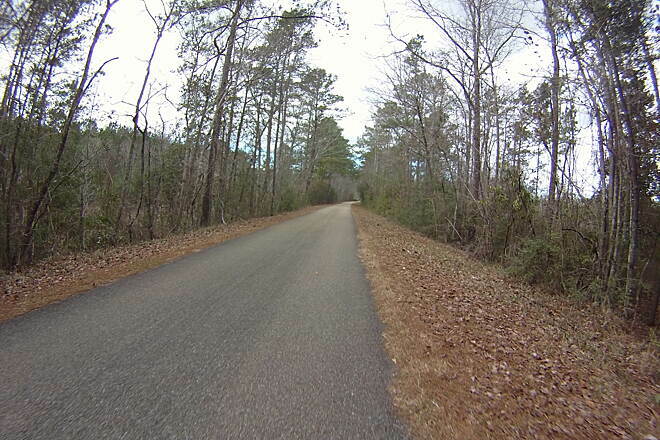 I havent gotten a chance to ride the trace in its entirety but I can tell you the ride from USM to sumrall is very nice, very little grade in the pavement which makes pedaling simple. I took a 8 mile ride today for fun and I cant wait to do it again maybe tomorrow. Started at prentiss. Found bathrooms were locked down on a beautiful Sunday afternoon. About a mile into ride met a dude out of deliverance shooting a pistol off the trail at an unkonwn object in the creek He just gave us a funny grin and wouldn't say a word. The sheriff responded immediately to the call we made The guy disappeared. A few miles later we ran into what looked like a grandfather and grandson on leisurely stroll with a rifle. At Least he wasn't shooting. Other than this. Nice trail and day. 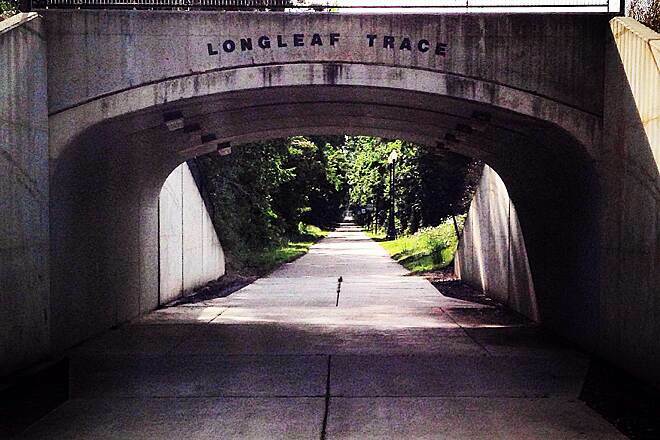 I rode the Lonleaf Trace April 5 & 6. Of all the rail-trails I've ridden, this is one of my favorites. It's very scenic and very well maintained. 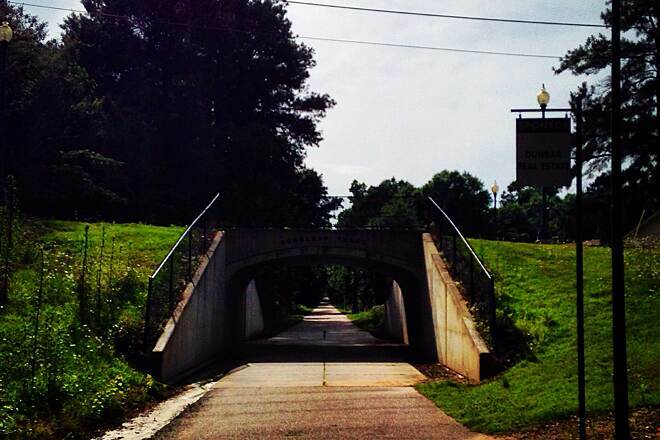 The 41-mile-long trail starts on the campus of the University of Southern Mississippi in Hattiesburg. This gateway, as well as all of the other trailheads are very easy to find by following the brown signs from I-59, US-98, US-49 and SR-42. 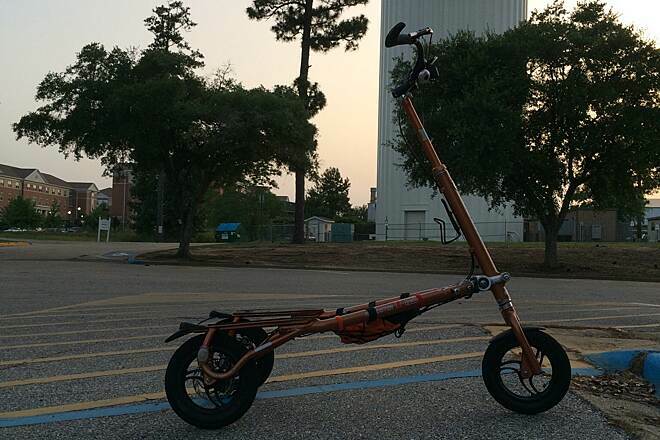 Parking is available on the Southern Mississippi campus in spaces reserved for trail users. Look for the tow-away zone. I was assurred that only cars belonging to University students would be towed from these spaces. 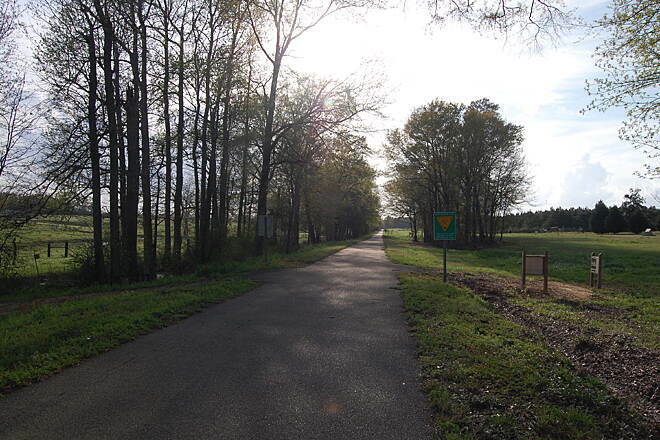 From Hattiesburg, the trail goes through quiet forest, small towns and past farms to the end in Pretiss. 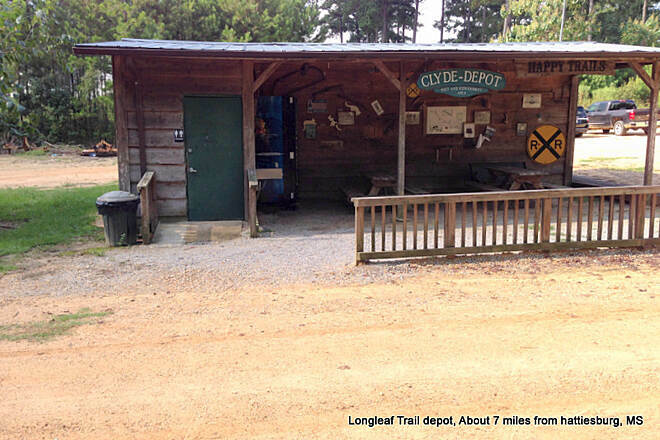 There are several trailheads along the way with restrooms and vending machines. There are also several covered rain shelters, which were not needed on my visit. The weather was beautiful with not a cloud in the sky. Also, there are numerous scenic rest areas along the trail. The pavement is very smooth the entire length and the trail is very clean and well maintained. Be sure to stop at the Clyde Depot and sign the visitor's notebook. It was interesting to see where other visitors had come from. All in all, this is one of the nicest rail-trails I've ever ridden. 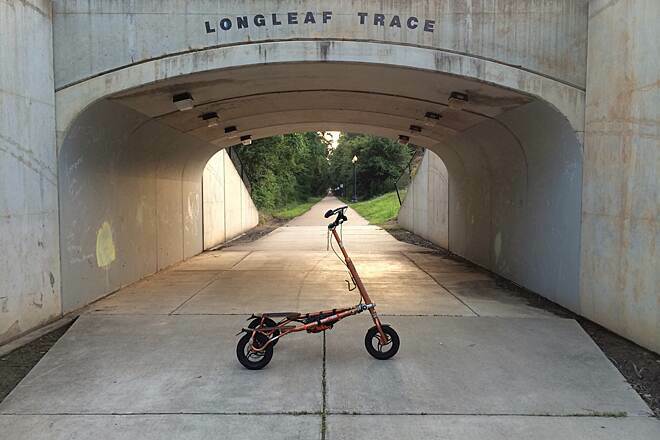 For the past year, I have been riding rail/trails all across the eastern portion of the US on my recumbent trike. Each new trail discovery continues to amaze me. 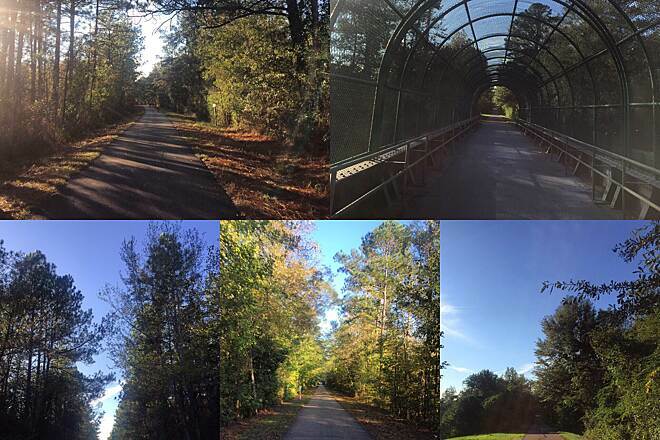 The Longleaf Trace is a wonderful trail. I rode this trail on 1/31/11 and I was impressed with the quality of this well maintained trail. 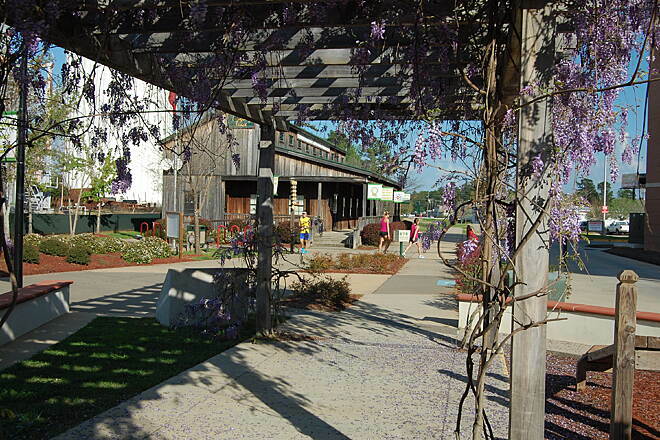 Riding out of the USM campus parking at the beginning of the trail, the first encounter is the beautiful Welcome Center for the trail. This center is part bike shop, part bike/recumbent rental, and, part snack shop. There are maps of the trail as well. Riding the first 12 or so miles, there is an impressive Tree Identification Project where dozens of tree species are named. I have never encountered so many varieties of trees. Even in the dead of winter, the trail is very well covered by trees. This trail would also be a great treat for those bird watchers out there. This trail is asphalt and can be used for inline skating and skateboards however, there are some bumps along the first ten or so miles. There are plenty of very clean, well maintained rest stops. There are also covered rain shelters along the trail. The Trace as it is called locally has a very nice mile marker system as well. One must take heed to the parking situation at the USM campus. There is a designated parking row for trail users only, however, it is filled to capacity with students using those spaces. I was lucky to find one open parking spot. The guide at the Welcome Center acknowleged the parking issue and said that a new parking lot is set to be constructed soon for trail users only. 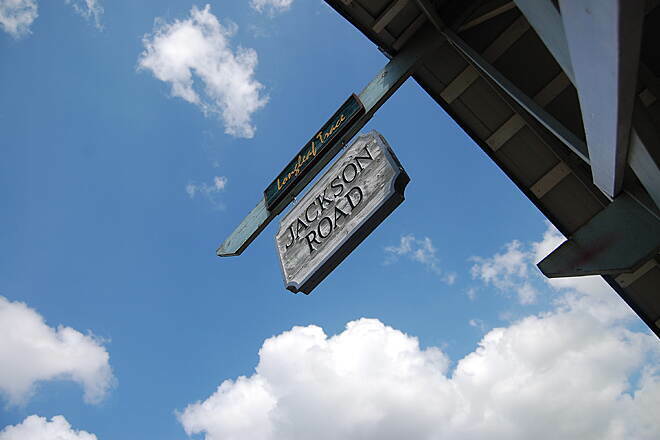 At the present time, trail users would best be served by parking at the Jackson Road Station trailhead which is at about mile 4 northwest of USM. 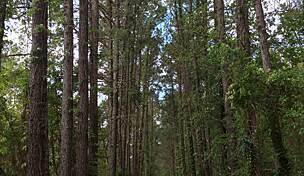 I would highly recommend the Longleaf Trace to anyone visiting the region as a must see/experience event. 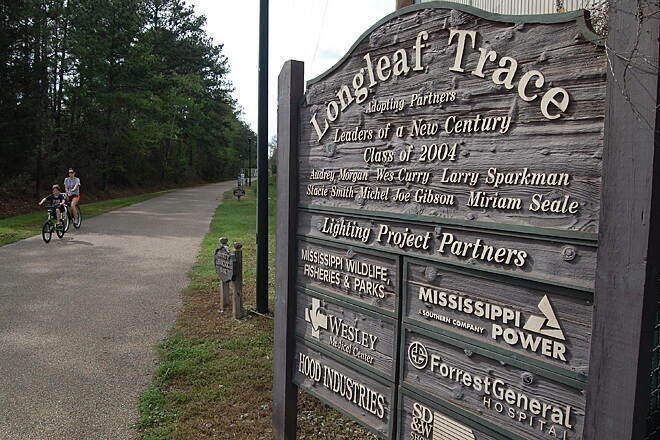 I have ridden several of the rail-trails in the last few years: Longleaf Trace was my first one and still the best in terms of ride-ability I think. 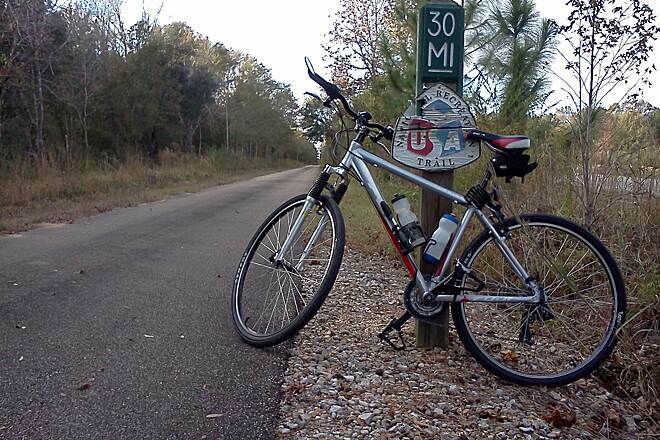 I rode the entire length from Hattiesburg out to Prentiss, and back, in about 7.5 hours last Friday, 11/12/10. The parking lot was very crowded as students are obviously using the lot even though the signs state that the parking is only for trail users. The trail itself is asphalt the entire length. The trial begins on the USM campus at mile marker 3.4. They have not been able to complete the downtown portion of the trail. 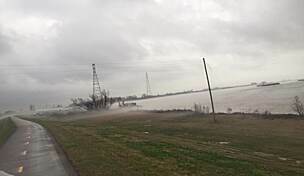 It ends in Prentiss at about mile marker 44. I saw MM 43 but never actually saw a 44 mm in the little park where the trail ends in Prentiss. For the first 10 to 15 miles out from Hattiesburg there are restrooms and a couple of stops with drink machines. Farther out there are rest-stops with restrooms and water fountains. The trail goes through a couple of small towns Sumrall and Bassfield. These are great places to run in for a drink or snack if you're going all the way. There isn't much in Prentiss. There is a convenience store just across the street from the park. It was gorgeous this time of year. The weather was perfect and not many people on the trail once I got out 10 miles or so from Hattiesburg. There are even lights on the trail a little ways out from Hattiesburg. By the way it's getting dark about 5:00 pm these days. It was fun riding the last few miles by the light of my Blackberry. I'm 49 years old and should have known better. There is a small county/state campground just outside Prentiss called Jefferson Davis campground. It's great access to the trail from there, 2.8 miles directly to the trail. This deserves a top award for being well kept, plenty of rest stops, restrooms, cold water and beautiful. 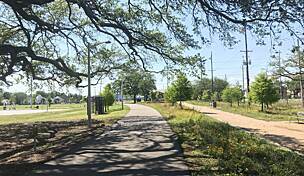 residents are very proud of the trail and want to keep it that way. I plan to go back and it is over 500 miles from my home. This is one of the nicest trails I have ever ridden. Wide paved, plenty of cold water available, clean well kept facilities. My wife and I have been down here three times from Chicago to ride the trail in the spring. There is nothing like warm weather, sunshine and flowers to get one out of the winter doldrums. We have ridden the length of the trail most years. Prentiss is the only bad spot for us. For whatever reason the facilities there are always locked. That is the western trail head. It is a fairly long climb from Prentiss, so save yourself some work and start in Bassfield or someplace further east. 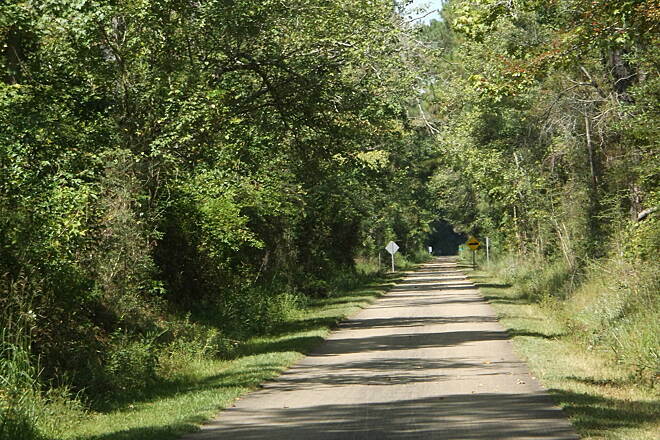 This is a great trail, best in Mississippi, probably best in the South, maybe even world. 10' wide, 12' in places, paved and almost level. The equestrain trail is great for horseback riding and wagons, and also great for trail runners, hikers, and mountain bikers. Lots of connecting trails for more variety. Has an award winning web site with lots of information. Extensions planned in Hattiesburg and Jeff Davis County. 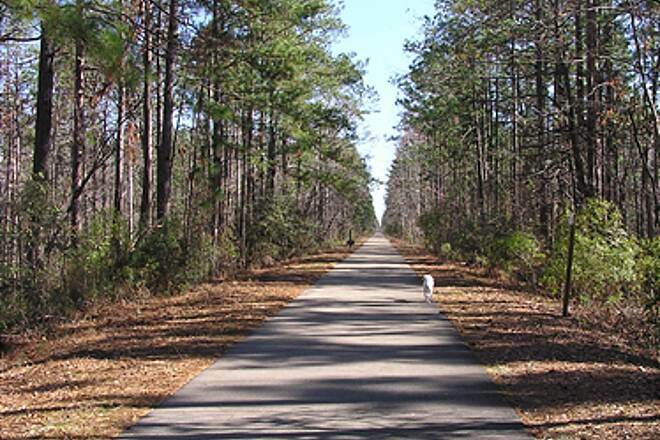 My wife and I have ridden on the Longleaf Trace a number of times. We are here on the coast and do some riding down here, but when we want to make a good ride better, we take it to the Trace. There are places to take breaks, there are refreshment stops, and there are places where one can be picked up if there are emergencies or malfuntions. I see this as an assette to the community and a good place to prove ones ability on the cycles as well. There is no competition between automobiles and the Trace travelers. It is a fantastic situation. A situation that cannot be improved upon! You have the beautiful canopy of trees to help along the way. "Excellent trail, nice rest areas along the way,if you don't have a bike rent one in Hattisburg,friendly helpful staff." 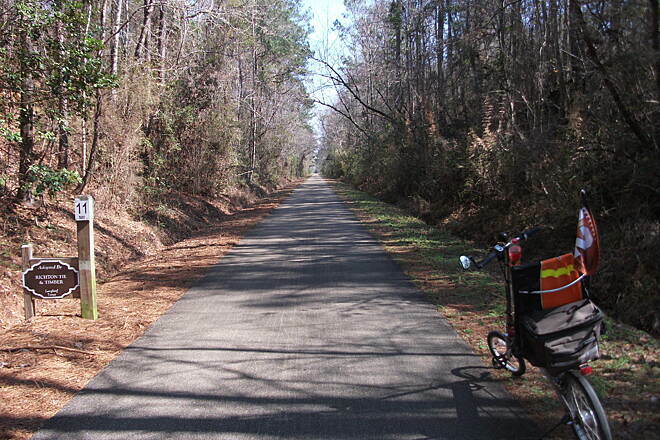 "The Longleaf Trace is by far the best bike trail in Mississippi and one of the best in the southeast. Their web site is first class, too. Highly recommended!" "This is an awesome awesome oportunity for locals to take advantage. Mississippi falls short in comparisons to other states in many areas, but this is one area that can set a welcoming example of where this state can be innovative. I was out there yesterday and as a Mississippi resident am proud to say that the trail was well used and very clean. Bob was very helpful in providing information and had a warm attitude. I would highly recommend this to the outdoor adventurist or beginner. " 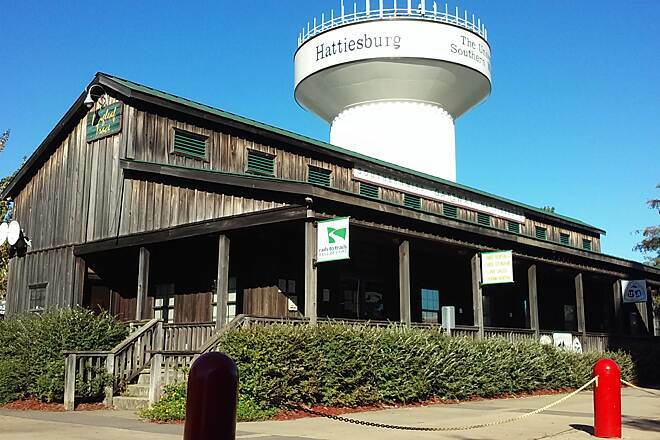 "Received great welcome from Bill at the Hattiesburg trailhead. Super information stop. Last paragraph of directions in thecdiscription is misleading - not exactly correct. VC is West on 4th - 4th runs E & W. VC 1 block from 49. We started at Jackson St Station and rode past Canyon a couple of miles and back. 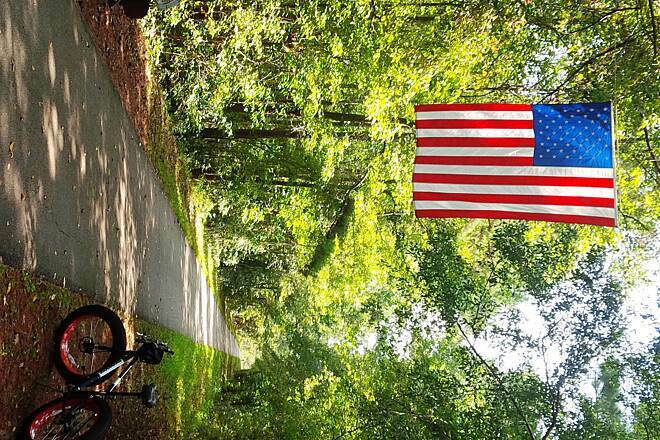 Highlight of ride was the American flag hanging across the trail! Beautiful! Note: The VC rents bikes, tandems & recumbant bikes. " "A very nice tree lined trail. We rode from the USM parking trailhead where there is adequate and safe parking. We appreciated the signs identifying the trees. We wanted to ride from Prentiss or Bassfield, but were concerned because there were no other cars in the parking areas and no other riders in sight. We considered the parking in these areas less then desirable were concerned about security." This is one of the best maintained and layed out trails we have ridden. There are many rest stops built on platforms with benches and some with tables. Some benches convert to tables. Many of the major road crossings have clean restrooms with coke machines. The trail edges are trimmed and the asphalt surface is blown clear of trash. We have ridden half of it and plan to come back to ride the rest. "We rode the trail a couple of weeks ago and thought it was wonderful! 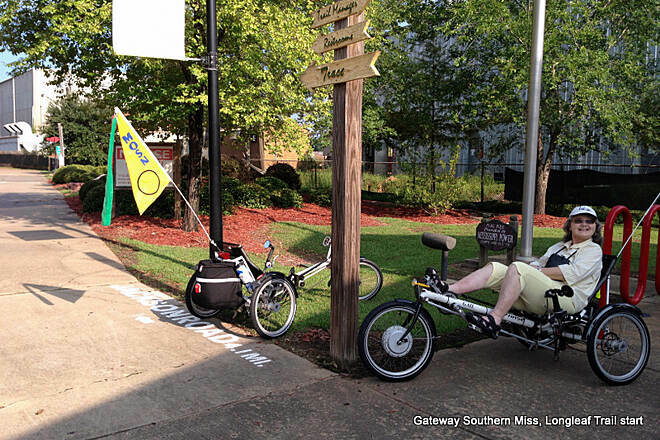 On the first day, we rode from Sumrall to Hattiesburg. We spoke with two very nice and helpful gentlemen in the trailhead office who recommended restaurants, etc. for us while we were there. We had lunch at one of the places they recommended, Strick's BBQ. It was easy to get to and the food was really good. After lunch, we rode to Lott's Circle and then returned to Sumrall. We then went by car to Prentiss, which is a lovely town, and stayed at the Bayliss B&B. That night, we had dinner at Cowboy Jim's which has great atmosphere and wonderful food. The next day, we rode from Prentiss to Lott's Circle and back. We were trying to beat the weather that day. Anyway, the trail is great. The scenery is really nice and the rest areas along the way were nice. Although I live in Louisiana now, I grew up in Mississippi and and think the Longleaf is something that Mississippians should be proud of and take advantage of." Best in the southeast U.S. This trail has the best overall rest areas of any trail I have been on and I have done over a hundred rail trails from Washington to Florida. Very quiet place to ride on a weekday. The trees do a good job of blocking the wind and providing shade. I was able to go from Hattiesberg to Prentiess and back in the same day. 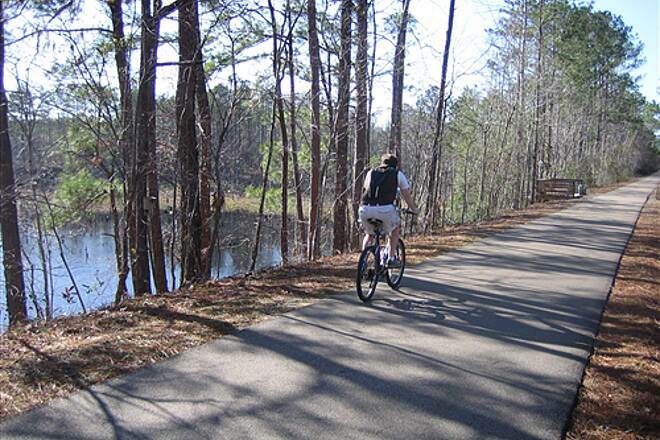 "I have ridden many, many trails and have decided that my weekend ride of the Longleaf Trace was the best by far. The facilities were excellent with rest rooms and drink machines all along the way. There were also small towns with restaurants convenient to the trail. My only complaint was that each rest stop ended up with so much conversation with other bike riders that we got behind schedule." 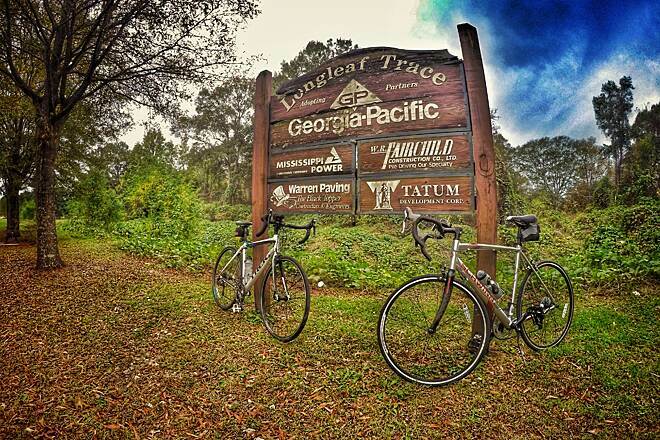 "We have ridden several trails in the south and were very impressed with the Longleaf Trace. Rider considerations, like the covered rain shelters and rest depots, are very conveniently located and well-planned. We felt safe and comfortable in the quiet wilderness. Trail etiquette is lax with riders meandering on both sides of the trail. We rate this trail an 8/10 and will definitely visit again." "We have been biking for several years in several states. This by far is the best kept secret in the south. It's quiet, peaceful, has rest stops, shelter and bathroom stops, and is well maintained. Why this biking trail has not been discovered is beyond my understanding. Congratulations Mississippi: You are in a league of your own this time." "I've vacationed on bike trails in Mississippi, Alabama and Louisiana. The Longleaf Trace is the very best trail that I have been to. There is great scenery, an easy grade, the trail is well marked and just lots of variety." "With rainy weather, we only rode from the Hattiesburg trailhead to Sumrall and back but the trail and supporting facilities sure were great. We hope to get back next winter and ride the whole trail. We stayed nearby at the Sunny Grove B&B, which was very nice." 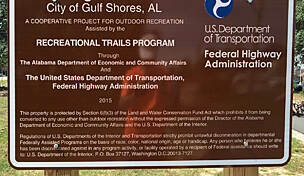 "My husband and I just biked part of this trail last weekend (25 miles of it) from Hattiesburg to north of Sumerall. We had a wonderful time. This is truly one of the best trails we have EVER been on. The trail is mostly flat with a few LONG inclines. The trail is very well maintained with plenty of places to stop, catch your breath, get a drink and enjoy the surroundings. The trail has emergency first aid kits spaced along the way (we thought this was an excellent idea). We stopped in Sumerall to eat lunch at a good place right across from the Trent Lott Memorial Park. We had the pleasure of spending the night at the Cabin Bed and Breakfast, which is only 100 yards off the trail (north of Hattiesburg). It was an excellent choice -- very affordable and a gracious host. This trail is a MUST DO!" "It was February and we were driving north to home and snow. What a treat to discover this forest trail and enjoy one last warm ride. To those people I met who wondered if I was cold, there was a good reason for wearing only a t-shirt. First class trailhead facilities....have never seen anything quite up to that standard. Perhaps this Feburary we will escape the winter cold and return to ride the entire trail." 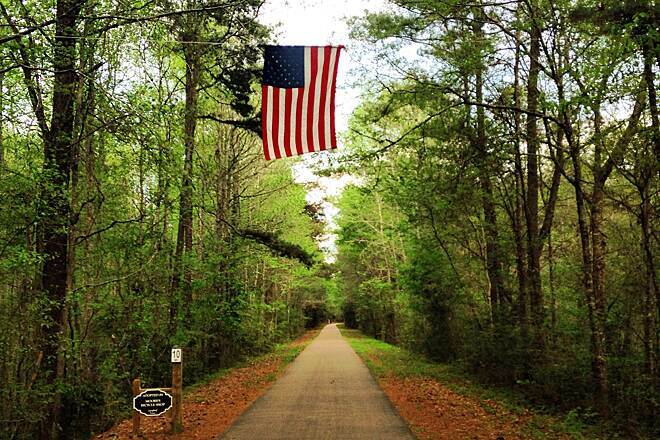 "My wife and I rode this trail this weekend starting in Hattiesburg and spending the night at a motel in Prentiss. The trail was an absolute pleasure to ride; we saw a lot of wildlife including numerous squirrels, rabbits and deer. We also saw a few small snakes. The outlook over the Beaver pond was a great rest stop along with the unique Cedar sided depot in Chipley. The only thing we would do different would be to start in Prentiss and end in Hattiesburg where we would more choices for lodging and dinner." "I drove up to Hattiesburg from New Orleans on a Saturday. From Jackson Station I rode my bike to Prentiss. It took me roughly 3.5 hours. I stayed in a lovely motel in Prentiss called the Jeffersonian. The owner was very cordial and a single with tax was $34 and change. I grabbed a sandwich at the Tri-Corner Grill. (Right, on the main drag, as you leave the trail's end. Go in the opposite direction for motel accomodations.) People waved to say hello and at every opportunity I engaged them in conversation. They helped bring an ambiance to the experience that was priceless. I met a couple of kids on horseback and what appeared to be their granddad driving a horse drawn wagon. Amazingly enough I had a Mississippi Belle wave at me with the brightest smile I have seen in quite a while. Her boyfriend looked like he played football for ""Old Miss"" so I waved and pedaled on. I was greeted by all the other users on the trail. What a pleasure to find such remarkably friendly people. I am going to bring back some friends. This rails to trails ride deserves four stars, but make sure you stop and meet some people along the way. I almost forgot. Lookout for pecans on the trail. You thin tired riders might experience a nasty fall. Try it, you will like it. " "As an engineer who has been running trains for some 23 years, I truly believe that I have one of the best jobs in the world. Aside from the thrill I get from actually running trains, I also feel that I am carrying on an American tradition that help to build this great country of ours. I see it everyday in the towns that I pass through. So when I'm riding my bike though this old railroad corridor, my perspective may be a bit unique than others who pass through. I can almost hear the whistle blow and the bell ring as the giant steam engine made its' way though the country side, bellowing out a loud thunder of black smoke, with wheels squealing under the heavy weight of it's cargo being delivered down the road. This route to me is not just another trail that was design for recreational use, but came with a history, one that served it's community well back then as well as it does today. See, by use and support of this rail-to-trail converstion, we can also keep our history alive. This past week was my second trip through Longleaf Trace. 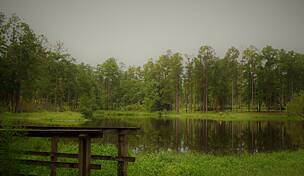 I find camping at Paul B. Johnson State Park in Hattiesburg a convenience considering it's so close to the trail. This trail is well kept up, but if you bring food along, you'll have to tote it out because of the lack of trash cans. Enjoy!!! 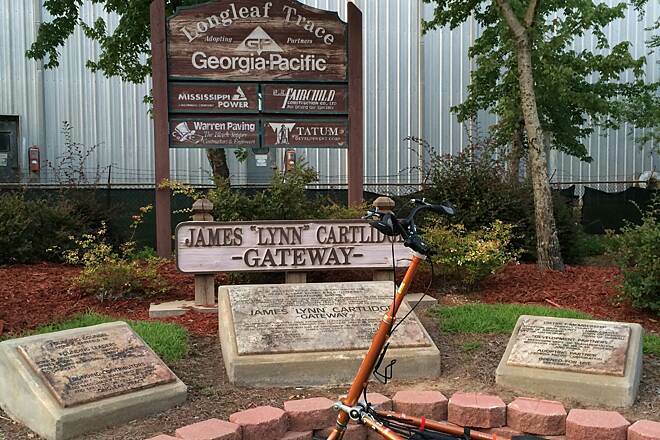 "Just heard about the trail from someone who works at the Tammany Trace Trail in Louisiana and decided to take a side trip to ride the Longleaf. Parked at Jackson Station (approximately mile marker 7) and rode to mile marker 20 and back on my road bike. Nice long straight stretches of gentle grades and curves. A little cold today, but minimal traffic on this trail and nice scenery through the woods. Several nice way stations with restrooms and water available. Well worth the time to go ride this trail. "